What did you get out of this lesson? Father God, Thank you for the scriptures you have given me to memorize. Please show me which weapon you want me to use to cut through deceptions and gain your victory in any battle I may face today. Your Word I have hid in my heart, so I will not sin against You, Lord. AMEN. "Casting all your care upon him; for he careth for you." My Confession:Faith comes by hearing, and hearing by the Word of God. I hear the Word on healing, act on it, and confidently receive my healing. "What is the true meaning of Christmas?" The true meaning of Christmas is love. John 3:16-17says, "For God so loved the world that he gave his one and only Son, that whoever believes in him shall not perish but have eternal life. For God did not send his Son into the world to condemn the world, but to save the world through him." The true meaning of Christmas is the celebration of this incredible act of love. 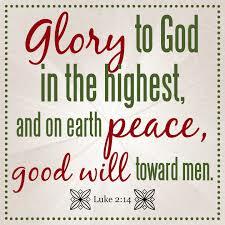 The real Christmas story is the story of God’s becoming a human being in the Person of Jesus Christ. Why did God do such a thing? Because He loves us! Why was Christmas necessary? Because we needed a Savior! Why does God love us so much? Because He is love itself (1 John 4:8). Why do we celebrate Christmas each year? Out of gratitude for what God did for us, we remember His birth by giving each other gifts, worshipping Him, and being especially conscious of the poor and less fortunate. The true meaning of Christmas is love. God loved His own and provided a way—the only Way—for us to spend eternity with Him. He gave His only Son to take our punishment for our sins. He paid the price in full, and we are free from condemnation when we accept that free gift of love. "But God demonstrated His own love for us in this: while we were still sinners, Christ died for us" (Romans 5:8). Motivation, Encouragement and lots of laughs is always the order of the day! !